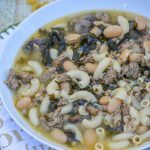 A hearty soup, this version features Italian sausage, kale leaves, and your choices of pasta with a bevy of seasonings. Heat a dutch oven over medium heat add 2 tbsp olive oil and cook sausage until no longer pink, between five and seven minutes, stirring occasionally. If necessary, drain sausage. Toss in the beans, and stir in until they heat through. Serve with crusty bread & let it warm you up!